Pricing pages are probably the most important pages on your website. Getting it right means visitors turn into leads, lead turn into customers. On the other hand, If you get it wrong, prospects will most probably close the tab and leave for good. The art of writing a good pricing page is not an easy thing to do. However, it is a lot more easier if you try and use psychological mechanisms to influence and persuade potential buyers. We’ve chosen 5 most important and useful pricing tactics that when combined with psychology can change a lot in terms of numbers and sales for your website/company. First off, your pricing page needs to show a sense of authority, seriousness and trust. 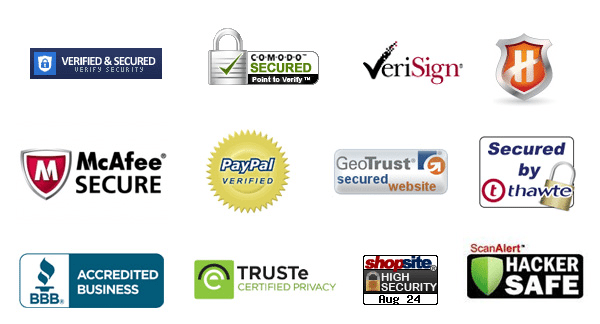 In order to do this, display icons containing the SSL security symbol on the pricing page. This builds additional trust, legitimacy with people because forty-nine percent of online buyers are worried about the security of their personal information. Another way to build trust is to use testimonials on your pricing page. Adding testimonials lowers the likelihood people bothering with additional research. And according to HubSpot, fifty-seven percent of buyers leave to search for reviews and testimonials if you they can’t find any on your website. A good idea is to make a list of all the payment methods your product supports or security certifications your site has. Also, add the company logos to your pricing page close to the checkout CTA. For instance, if you accept PayPal, you can use their secure checkout logos for free. The strategy called the left-digit effect which was popular for decades says that people pay more attention to the number on the left hence ending prices in .99 or .95. But this no longer works as it used to. I general people use their emotions and gut to decide whether to buy a certain product but when shown prices as whole numbers. When presenting prices as non-whole numbers ($4.99), people use logic to decide. Nowadays, it’s fairly uncommon to find a price that’s not a whole number. Rely on the emotions of your buyer, not their sense of logic. If you can skip the .99 on your pricing model. Instead use round numbers only. But if you want to leave an impression that your product is a little cheaper, go with prices that end in nine, like $19, $29, etc. Don’t pitch, don’t sell, rather — tell stories. Research says that when people connect with stories, they produce more oxytocin. In this same fashion customers feel connected to your brand when they feel emotion about a story on your website. On your pricing page, though, don’t list out boring features. Use everyday language that appeals to your target and, of course, everyday users. For each feature focus on the pain point behind it. Ask yourself why does your customer need or care about any particular feature? A sense of urgency portrayal is not a recent thing in marketing. From big CTAs like “Buy Now!” “Order ends in 1 day!” to one-day sales, this technique tries to nudge consumers to take action as fast as possible. B2B marketers are using this to sell SaaS products too. There are apps that let you display a countdown timer to each visitor of a webpage. This way you can turn your pricing page into a unique special offer for each person. Psychologically this strategy is efficient because humans have tendency to response fast to deadlines. It’s proven that humans become impulsive when faced with making an urgent decision. When people act before a certain deadline or get a discount something called the reward center of the brain is activated. For example, getting a great deal for a product at the lowest possible price. Experiment with adding deadlines on your pricing page by using apps to see which deadline length boosts your conversions the most. Another psychological concept that works charms in marketing is the human desire for herd mentality. Herd mentality happens when people demonstrate behavior or act the same way as the people around them — often being ignorant of their own feelings in the process. This is especially common in unfamiliar situations. We tend to watch how others behave so we can have pointers on how we should behave. In other words, most people go with the majority or the flow and feel reassured when others tell them what to do. When it comes to buying something, we naturally assume if others purchased the item, it would also be correct for us to buy it, too. Showing a real user or number of subscribers who has bought your product to prospects shows social acceptance. If others have bought it, it must be good, right? Prospects feel more comfortable to buy when they see others have bought from you. Adding social proof to your pricing or checkout pages can also improve conversions. Truth is nothing can save a bad product. But it is also true that even the best product in the world can be improved and sell more by applying psychological triggers to your carefully designed pricing page.